Filing for divorce can be a long, intricate process. There are hearings, mediation, meetings with attorneys, arbitration, custody disputes, division of property, and more. And then there are the divorce forms to contend with. We’re talking paperwork on top of paperwork. All of this can be overwhelming. On a basic level, however, filing for divorce in Oregon doesn’t need to be scary or as complex as it seems. It is a process to be sure, but the steps are relatively straightforward. Being as prepared as possible will only benefit your case. It never hurts to familiarize yourself with the stages ahead of time. With that in mind, here’s an overview of the process and a look at the divorce forms you may encounter. Like with any process, there is the moment when it begins. In the case of divorce, that is when one spouse completes and files the Petition for the Dissolution of Marriage. Though the underlying reasons for this are likely very complicated, as far as ending your marriage goes, the first step is relatively simple. and each party’s current living situation. Shared assets and debts may also be disclosed at this juncture. In Oregon, there are two types of dissolution. Which type is appropriate for your case depends on the specifics of your situation and the complexity of your marriage. If your situation is relatively simple and straightforward, you may qualify for a summary dissolution. This allows you to end your marriage without the cost and hold up inherent in court hearings. and you both give up claims to spousal support. If your case does not meet the requirements for summary dissolution, you will have to follow a more traditional path and file for a dissolution of marriage. What you need to file will vary some depending on the circumstances. Things are different when children are involved in the process. Child custody disputes can become heated and contentious, and the divorce forms vary as well. If there are minor children in play, in addition to the standard divorce forms, you will need to fill out others that lay out child support payments, child custody, visitation, and more. Once the appropriate divorce forms have been filled out, the next step is to file them with the court. When filing for divorce in Oregon, you submit the paperwork in the county where you or your spouse live, not the county where you were married. There is currently a $273 fee attached to file for divorce. You must also fulfill the state residency requirements, which are fairly simple. Either you or your spouse must have lived in Oregon for at least six months. Once the appropriate divorce forms are filed in the appropriate court, the next step is to serve your spouse and make your intentions known. In most cases, this is accomplished by hiring an outside process server. However, if you’ve enlisted a divorce attorney, he or she can handle this step. In uncontested divorces, your spouse only needs to sign the Acceptance of Service to acknowledge delivery. 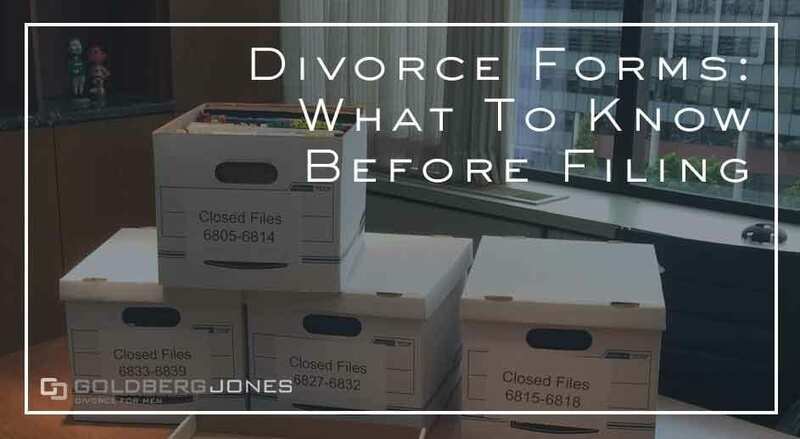 It’s between the initial filing and the signing of the final divorce decree where the process often gets messy. This is where you and your soon-to-be-ex fight over child custody, the division of property, spousal support, and all the rest. But once you reach a final agreement — this can be on your own, with the aid of attorneys, through trial or mediation — and the court confirms that everything is in order, all that’s left to do is add you signature. It may be in your best interest to have an experienced lawyer look over your divorce forms before you sign. But once you do, your divorce is final. As they lay out the concrete terms of your split, these finalizing documents are some of the most vital divorce forms. At the top of this list is the General Judgement of Dissolution. Why is this so important? This is the big boss, end-all, be-all of your divorce forms. Here is where all of the terms and agreements are spelled out in explicit detail. Child custody, child support, spousal support, debt division, and all the other issues you’ve fought about through the process. A judge signs the General Judgement and you and your spouse are legally bound. Because of that, it’s critical to make sure this document is prepared correctly, everything agreed upon appears in writing, and that there are no errors. Make sure that you have the most current versions of the appropriate divorce forms. Fill them all out clearly and completely — take your time, use your best penmanship. Sign the divorce forms in the appropriate places. Double check that they are complete and be sure to keep copies for your own personal records. It never hurts to have an experienced attorney look over your paperwork. If you have any questions about your divorce forms or are looking for legal counsel, feel free to contact Goldberg Jones at our Portland offices.